Built including the same two-oscillator sound structure with 18 non-bandlimited waveforms, two ADSR envelopes (amp and filter), snapshot and morph sections at the top of the GUI, 6-filters and the various interesting "mulch" modifiers, Mr. Alias 2 Pro has important additional features that its little brother lacks. These include: the 'Page Switch' button located above the Amp Envelope accesses a window that has a third, assignable ADSR envelope and two LFOs with relative depth and rate controls. There are two 'draw' buttons that allow to draw waveshapes that can be saved and loaded for use with the oscillators and the LFOs. Drawn waves can be inverted, normalized or reversed, and are savable as .wav files. 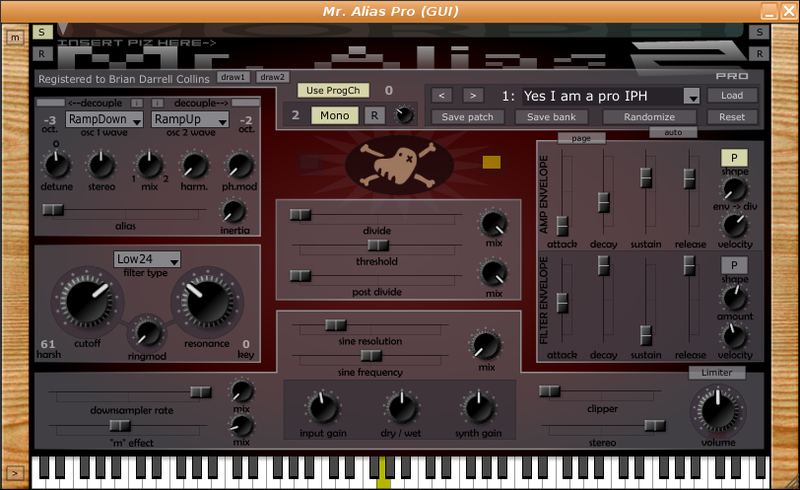 The GUI for Mr. Alias 2 Pro is skinnable, and comes with two additional skins in addition to the default. There is a manual included in this Pro version as well, with a bit of additional information useful for getting the most out of this unique synthesizer. My first (rolling) bank of presets (currently 31 "tamed and traditional" presets) and a couple of drawn waveforms: here. Place the waveforms in the MrAliasPro/drawablewaves folder and the bank in the MrAliasPro/sounds folder.